Gene Sharp hardly seems like one of the world's most dangerous men. White-haired and soft-spoken, the 83-year-old professor mostly keeps to himself, spending much of his time in his small Boston home reading, writing, and tending to his orchid garden. But to the world's most brutal dictators, Professor Sharp's ideas have proven catastrophic. In this fascinating new film, director Ruaridh Arrow details how an obscure list of nonviolent actions authored by Sharp in 1973 has served as a blueprint for anti-authoritarian revolts everywhere from Eastern Europe and the Balkans to the Arab Spring. As much about the substance of Sharp's "198 Methods of Nonviolent Action" as it is about the courageous democratic rebels who have made these methods their own, How to Start a Revolution bears witness to the power of nonviolent struggle, and show how one person of conscience can quietly influence the lives of millions of people. Features commentary from Sharp's close ally Retired U.S. Army Colonel Robert Helvey, Sharp himself, and many of the revolutionary leaders his work has inspired. DVD contains two versions: a full length version (82 minutes) and an abridged version (52 minutes). "A world conquering British documentary"
"A vital conversation starter and educational tool for a world awash with violence." "A powerful, moving, and beautifully produced film." "While Gandhi gave us the tactics and philosophy of nonviolence, Gene Sharp offers a systematic strategy of civil resistance. Liberation movements across the world are proving that this strategy is effective, even against tyrants. Thanks to Sharp, we can now realistically envision a world without war." "Will likely challenge and broaden the way people think about the continuing struggle for freedom and constitutional democracy around the world. Indeed, it is rare that a film offers so much to engage with. Unusually provocative and intellectually rigorous, How to Start a Revolution is recommended quite keenly." "This excellent film confirms Gene Sharp as the 'Einstein of nonviolent resistance,' the singular pioneer in a relatively new field of inquiry and practice, whose influence on social revolutions rightfully stretches across time and place, religion and race. How to Start a Revolution should be required viewing not only in courses on nonviolence and peace studies, but really in any course that examines political change and prescribes remedies for social justice." "For more than half a century, Gene Sharp has studied the power of nonviolent action against dictatorship, occupation, and social and economic injustice and has analyzed why it has become a force more powerful than war. This remarkable documentary tells the story behind the man, working out of a simple home office in a working class neighborhood of Boston, whose writings have inspired popular struggles for freedom and justice worldwide. Anyone who doubts the power of ideas should see this film." "Rather than being the refuge of the powerless or a form of passivity, this compelling video makes it clear that well-strategized and persistent nonviolent action is a force that can shake the world. 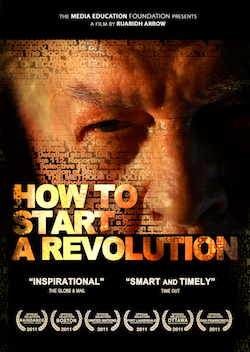 How to Start a Revolution highlights the enormous contribution that Gene Sharp has made to showing us, in pragmatic terms, how this force can best be used to undermine dictators and empower ordinary citizens. It is a source of continuing amazement to me that Sharp was not long ago awarded the Nobel Peace Prize." "This is a powerful film about a powerful idea -- indeed, perhaps the only idea that is more powerful than violence. It is emotionally engrossing, intellectually compelling, and as fresh and up-to-date as tomorrow's headlines. It shows how Gene Sharp's ideas of nonviolent resistance have been -- and will doubtless continue to be -- central to the most important political changes taking place on our planet." "How to Start a Revolution is a brilliant and timely reminder that not only can nonviolent action be dramatically effective, but that the change it produces is likely to be more enduring than that wrought through violence and bloodshed. And in celebrating Gene Sharp it gives prominence to an unlikely hero of the peace movement, whose work and influence will in time come to be seen as seminal in helping to shape a new path for humankind." "How to Start a Revolution shows how Gene Sharp's simple tools of nonviolent action have helped people around the world stand up to powerful forces and aggression. The Harvard Law School Program on Negotiation was pleased to show How to Start a Revolution, and to honor the work of Gene Sharp and filmmaker Ruaridh Arrow. When someone asks you if it's possible to stand up to a dictator or overthrow an autocratic regime, tell them to go watch this remarkable film." "At last, a film focused solely on Gene Sharp's formidable intellectual influence on historical and contemporary conflicts. A brilliant film celebrating a brilliant man. Bravo!"